Thousands of Belgian students stayed away from school the past two Thursdays to join protests in Brussels. 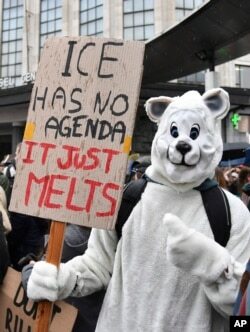 The protesters have been demanding action to fight climate change. The first demonstration took place on January 10. Organizers have announced plans to keep holding demonstrations every Thursday. Many students have promised to skip classes and join the protesters. About 3,000 Belgian students attended the first protest, called Youth for Climate, the Brussels Times reported. More than 10,000 students joined the second demonstration, held on January 17. The number included young people from both the country’s Flemish-speaking north and French-speaking south. That day, protesters faced cold and wet weather conditions in Brussels. They carried signs with messages like “School strike 4 Climate” and “Skipping school? No. We fight for our future.” The demonstrations were peaceful, with no incidents reported. More than 75,000 people took to the streets of Brussels last month in Belgium’s largest-ever climate march. But the latest protests were held especially for school-aged students who chose to miss class. The student protesters have demanded stronger government environment policies relating to climate change. Before the first protest, school officials warned students that missing school – even to attend a demonstration – violated school and government policies. But before the second protest, many schools decided to give students permission to take part, the Brussels Times reported. The newspaper said students would be asked to prove their presence by showing a picture of themselves at the protest. The European Environmental Bureau (EEB) has expressed support for the student marches. The EEB is a collection of environmental activist groups across Europe. It has urged European leaders to support action to reduce dependence on coal, oil and natural gas. The EEB says the idea for “school strike” movements centered on the Earth’s environment came from Swedish student activist Greta Thunberg. She received attention for skipping school one day a week so that she could demonstrate in front of Sweden’s parliament building. The movement started in Sweden seems to be growing. On January 18, thousands of students in Germany and Switzerland chose to skip class to press for more action against climate change. Bryan Lynn wrote this story for VOA Learning English. His report was based on information from the Associated Press and Brussels Times. George Grow was the editor.